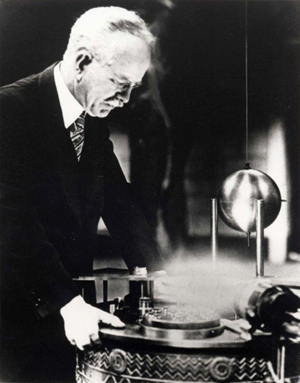 1925 Science Service Photograph of George Ellery Hale viewing the base of the Foucault pendulum in the Great Hall of the National Academy of Sciences Building. Courtesy of Society for Science & the Public. From the NAS Archives. Friday, May 4, 2012, 12 p.m. to 1 p.m.
Keck Center, 500 Fifth St., N.W., Room 109, Washington, D.C.
Photo ID and reservations are required. No charge. George Ellery Hale -- astrophysicist, institution builder, internationalist, National Academy of Sciences (NAS) member, and founder of the National Research Council (NRC) -- had a profound affect on American science in the 20th century, particularly on the NAS and the NRC. Join Cultural Programs of the NAS and the Academy Archives for Mirzayan Fellow Thomas Burnett's lecture on Hale's vision for the NAS in the 21st century. Hale (1868-1938) foresaw the need for an NAS building as early as 1906. He led the effort in developing the concept, design, funding, and decor of the building on Constitution Avenue, guiding it to completion in 1924. Known for his invention of the spectroheliograph, Hale also founded four astronomical observatories: Yerkes (Williams Bay, WI), Mt. Wilson (Pasadena, CA), Palomar (San Diego), and Hale Solar Laboratory (Pasadena). In addition to his scientific and academic accomplishments, Hale had a remarkable ability to integrate science into modern society. Among his wide array of interests, he was founder and first president of the Pasadena Music and Art Association; a trustee of the world-renowned Huntington Library; a student of European architecture and ancient Egypt and Greece; and a visionary for education policy. In an age with an ever widening gulf between scientific research and popular culture, Hale's vision for the NAS is just as relevant now as when he developed it a century ago. Thomas Burnett conducted his doctoral studies in the history of science at University of California, Berkeley. Currently a Mirzayan Fellow at the National Academy of Sciences, Burnett is working with CPNAS on an innovative multimedia project to share Hale's vision with a 21st century audience. This lecture is co-sponsored by the NAS Archives.